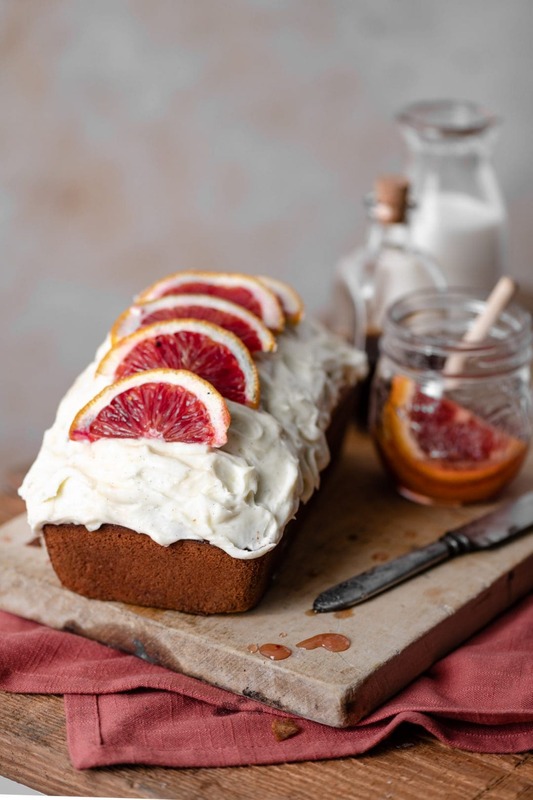 Blood Orange Cake can only mean one thing, citrus season has arrived folks!!! I scour the grocery stores every January for these crimson oranges. The flavor is sweet with a strong orange taste and a hint of raspberry. To me they are the ultimate citrus fruit, step aside tangelos and navals. 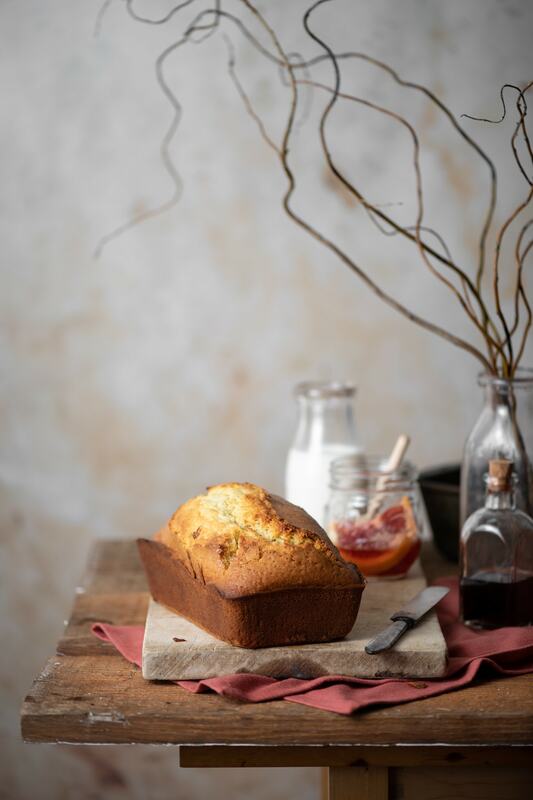 When you’re craving a light textured cake without heavy chocolate, I suggest going for something with a hint of fruit. 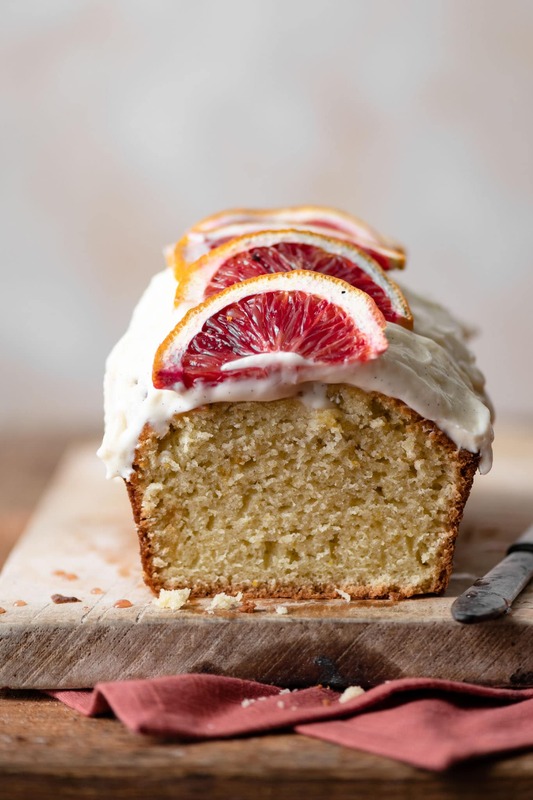 There are so many blood orange recipes, but for now I’m craving cake. Here’s where this recipe comes in. 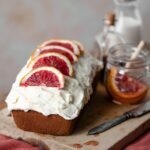 I wanted an easy loaf cake with a punch of orange flavor. 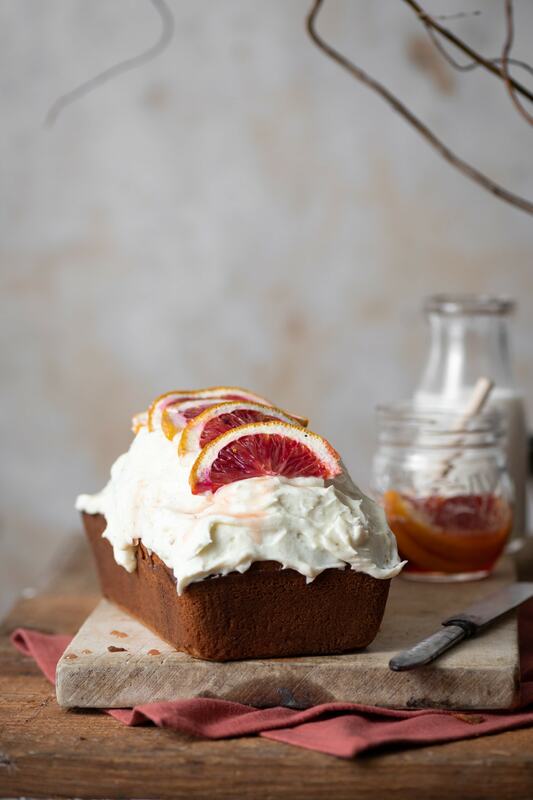 Combining fresh blood orange juice with orange zest lifts this cake to the next level. The texture is soft and fluffy due to the use of cake flour with olive oil. Oh and the vanilla creme fraiche frosting with a drizzle of blood orange honey helps too! I suggest you start your blood orange search while the getting is good. If your local store doesn’t carry them try specialty grocery stores or ask a local chef for shopping tips! Supposedly they are available January through May. Use a 9 x 5 inch loaf pan. Batter can also be converted into a single 8 inch round cake pan. I haven’t tried it as cupcakes, but if you do let me know. Olive oil can be substituted for grape-seed oil. Check your cake with a toothpick to confirm baked through the center. Slice a vanilla bean and scrape out the seeds for the vanilla creme fraiche. If you don’t have a vanilla bean, use 1 teaspoon of vanilla extract. Let cake cool completely before slathering on frosting. Mix 1 tablespoon of fresh squeezed blood orange juice with 3 Tablespoons of honey for your drizzle. 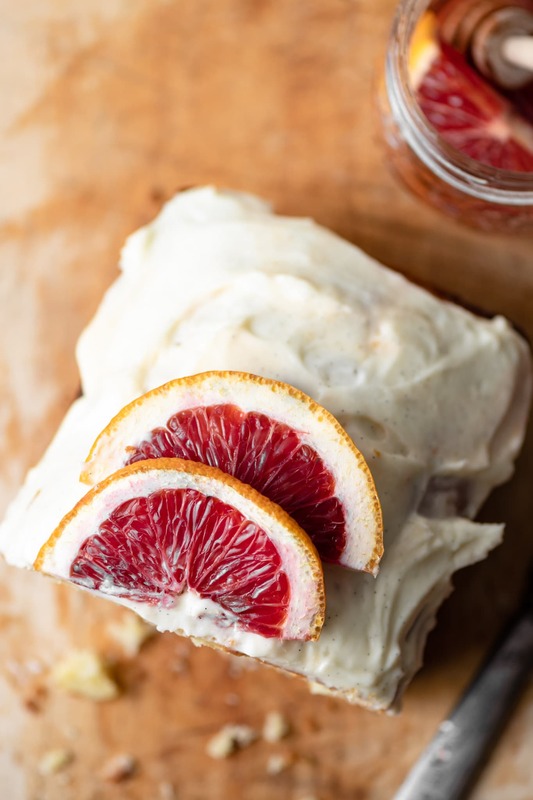 Olive Oil Blood Orange Cake is a light fluffy loaf cake flavored with blood orange juice and orange zest. Topped with vanilla bean creme fraiche frosting! Whisk together flour, baking powder, baking soda, and salt in a medium bowl. Set aside. In bowl of stand mixer with paddle attachment, mix together olive oil, milk, and sugar until combined. Add one egg at a time until incorporated. Continue to mix on medium low adding vanilla, orange juice, and orange zest. Next spoon in flour mixture. Mix on medium until a smooth batter is formed. May need to scrape sides and bottom of bowl to incorporate all ingredients. Pour cake batter into loaf pan. Place on middle oven rack. Bake 35-45 minutes or until toothpick inserted into the center comes out with only small crumbs. Let cake cool on wire rack completely before removing from loaf pan and frosting. In bowl of stand mixer with whisk attachment, beat butter until smooth. Combine Creme Fraiche, vanilla bean seeds, and powdered sugar in mixing bowl. Beat until thick and creamy. Scrape sides and bottom of bowl as needed.